Homemade Lemon Dessert Recipes too! I have several easy lemon recipes that are sure to please. You will find my moist homemade lemon cake recipe at the bottom of the page. From lemon drop martinis and lemon poke cake to lemon meringue ice cream pie, lemon chicken, lemon cheesecake and more below. Lemons will keep at room temperature for three or four days and up to two weeks if refrigerated. To maximize the amount of juice when squeezing, first roll the fruit under the palm of your hand on a flat surface to break down the inner fruit and release the juice. Keeping lemons at room temperature or warming the them for a few seconds in the microwave can also maximize the juice output. When zesting lemons, take care not to scrape off the pith (which is bitter). It is the white lining found beneath the rind. PREHEAT oven to 350 degrees. Grease and flour a 9x13 inch pan. In a large bowl, stir together the first four ingredients with the instant lemon pudding. Add the water, oil and eggs, mix until smooth and well blended. Spread batter evenly into the prepared pan. Bake for 40 to 45 minutes in the preheated oven, until a toothpick inserted comes out clean. While the cake is still hot, poke holes in the top with a fork. In a small bowl, mix together the lemon juice, butter, and powdered sugar; beat until smooth. Pour over hot cake. Another one of my easy lemon recipes is for this wonderful sauce. Goes great over crab cakes, salmon, asparagus and fish. Melt the butter in a saucepan over medium heat and add the flour and mix to form a paste. Next pour in the milk slowly and bring to a boil stirring constantly. Cook for two minutes or until thickened. Remove from heat and stir in the lemon juice, salt and cayenne pepper. This is excellent over chicken, asparagus and much more. fruit for dipping: apples, bananas, strawberries, grape and pineapple. Combine all ingredients except the whipped topping and fruit. Stir until well combined. Fold in the whipped cream. Dip the fruit into this sauce and refrigerate leftovers. You may add the fruit right into the sauce and serve over angel food cake or ice cream. Peel the lemons (make sure to leave the pith or bitter white part on the lemons, or you will have a bitter drink), and place the peel in a tall jar. Add the vodka (I recommend Grey Goose or Belvedere vodka) and cover loosely for one week to infuse. After 7 days, combine the sugar and water in a saucepan and boil for 15 minutes. DO NOT STIR. Take off heat and cool. Stir the vodka in with the sugar water, and strain into glass bottles that you want to serve this in - and cork it. Let sit for two weeks at room temperature. NOTE: Before serving, cut a half gallon milk carton in half and place the limoncello bottle in the center and fill half way with water. Add flowers or lemon slices and fill to the top. Freeze everything overnight, and when ready to serve, just peel off the carton and place in a bowl or plate. Serve in glasses or shot glasses. This keeps it chilled for quite a while, and looks lovely. Moisten the rim of the martini glasses with a lime and dip top of the glass in sugar. 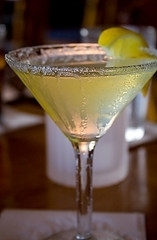 Place the lemon zest strip in the martini glass. Combine vodka, lime juice, sweet and sour mix, and ice into a shaker. Shake mixture until the outside of the shaker becomes frosty. Strain into the martini glass. A easy lemon recipe that is a wonderful treat after a long day at work. Bring the water to a boil and add the sugar. Continue boiling until the sugar is dissolved completely. Remove from heat and stir in the juice from the lemons and limes. Cool and it's ready to go. Store in a airtight container in the refrigerator. This makes 3 cups. You can use this when making margaritas also. 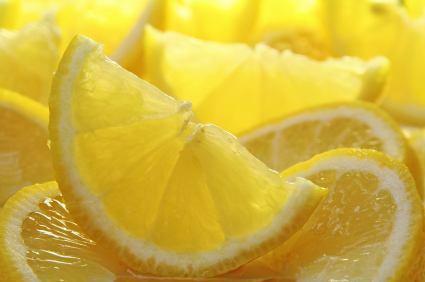 Combine the lemon juice and zest in a mixing bowl. Gradually stir in the milk, heavy cream and salt. Pour into an 8" baking dish, and freeze until firm. Remove ice cream one half at a time and run through a blender or food processor and beat until smooth. Pour into a plastic container with a lid. Cover first with saran wrap and then put the lid on securing tightly. Will keep in the freezer for one week. You gotta love this easy lemon recipe. I know I do. For the base, mix together the butter into the flour, lemon zest and powdered sugar. Mix with your fingers until it clings together. Press into a 9x13 pan, and bake for 15-20 minutes, or until just lightly browned. For the filling, beat together the eggs, sugar, lemon juice and lemon zest until light and fluffy. Sift the flour and baking powder together, and slowly add to the egg mixture. Pour over the baked, cooled crust. Bake for 25 minutes, cool completely and then sprinkle with powdered sugar; cut into bars. Make this easy lemon recipe for a bake sale and watch them disappear fast. PREHEAT oven to 350 degrees, and prepare a 8 or 9" springform pan for 9" deep dish pie plate. Process graham crackers and sugar until well blended. Add the egg white and mix until moistened. Press the crust in the bottom and half way up the sides of your pan. Bake for 8-10 minutes of until the crust is golden brown. Reduce heat to 325 degrees. As the pie crust is cooling, combine the room temperature sweetened milk and cream cheese. Beat until smooth. Carefully sprinkle in the cornstarch and be certain it is evenly distributed. Add eggs, egg beaters, vanilla, lemon zest and lemon juice and beat on low until smooth and creamy. Do not over mix. Pour into the cooled pie crust and do not go over the edge, as this will puff up when baking, but will deflate as it cools. If any bubbles appear on the surface, run a knife through the cheesecake to pop them. Bake for 40-45 minutes are until the edges are brown or when there are tiny cracks forming and the center does not jiggle when you shake the pan. Turn off the oven, and prop the door open and let the cheese cake sit in the oven for another 30-45 minutes. Transfer to a wire rack and let it cool completely. Chill in the refrigerator overnight. Mix the above ingredients together and refrigerate until it begins to cool. Do not let this set. Fold in the lemon filling and whipped topping in with the cooled lemon jell-O mixture. Chill several hours before serving. This is a very large fluffy and smooth salad. 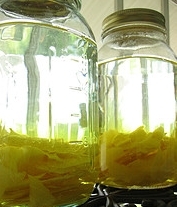 It is a wonderful easy lemon recipe to boot. Whisk eggs and egg yolks together and set aside. Melt the butter in a medium sized metal bowl over a large pot of simmering water. Whisk in sugar, lemon juice, lemon zest and salt. Gradually mix in the egg yolk mixture (slowly pouring a thin stream while whisking constantly, be careful not to cook the eggs. That's why they are added at room temperature). Continue to cook mixture while whisking until it thickens and reaches a temperature of 178-180 degrees; checked with a thermometer. This takes approximately 8 minutes or so. Transfer curd to a small bowl, and cover with plastic wrap - chill for a minimum of four hours. Curd may be made up to two days in advance. PREHEAT the oven to 400 degrees. Mix the pecans, sugar and butter together and press into a 9" or 10" glass pie plate. The mixture will be crumbly. Bake crust until lightly toasted or about 12 minutes. The crust will slip down on the sides; just use the back of a spoon and press the crust back into place. Cool the crust on a rack and then place in the freezer for 30 minutes. Dollop 1-1/2 cups of softened homemade vanilla ice cream in the bottom of the crust, and spread evenly. Spread the lemon curd over the ice cream, and freeze until firm or about 2 hours. Spread the additional 1-1/2 cups of ice cream over the lemon curd and again freeze until firm or about 2 hours. Using an electric mixer, beat the egg whites in a bowl until frothy. Beat in the cream of tartar, and gradually add the sugar. Beat until stiff peaks form, and spread meringue over the pie -- swirling decoratively. To brown the meringue, you may use a kitchen torch OR place pie in a preheated 500 degree oven until the meringue is golden in spots - approximately three minutes. Cut the pie into wedges and serve immediately. Refreshing and easy lemon recipe. NOTE: You may use sweetened whipped cream instead of the meringue. Melt butter in a large skillet over medium-high heat; add in green onions, chopped garlic, lemon zest and crushed chili flakes; cook stirring for 2 minutes. Reduce heat to medium and add in shrimp; cook tossing for about 2-3 minutes or until all the shrimp turns pink (this will not take long). Season with salt and lots of black pepper. Toss in the cooked angel hair pasta. Mix in the Parmesan cheese then pass more at the table. Melt the butter in a frying pan over medium heat. In a resealable bag, add the flour, salt and pepper and shake to mix completely. Add the chicken one piece at a time and shake to coat. Brown the chicken in the melted butter over medium high heat. When the chicken is brown, lower the heat to fry and cover the chicken until it is almost done. Add the mushroom slices and pour the lemon juice over all of the chicken and continue to cook until the chicken is done or the juices run clear. Serve with thin lemon slices on top of the chicken breasts.